When you can’t make it into the office, but need to speak to your doctor, a remote appointment can provide the opportunity to talk to your doctor and get a diagnosis and prescription quickly. 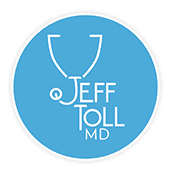 Jeff Toll, MD, offers telemedicine appointments for your convenience. Whether you’re traveling, or if you don’t feel well enough to come into the office, you can meet with Dr. Toll at his virtual office — powered by EVisit® — for your primary care and urgent care needs. Call or schedule your appointment online today. Members of the concierge service get the telemedicine visits for free, while they cost $95 for all non-members. Telemedicine is the ability to meet with your doctor virtually, using technology similar to Skype® or FaceTime. While telemedicine was originally invented to provide medical care to people who live in remote places, today, telemedicine provides convenient access to your doctor regardless of your location. In many situations, Dr. Toll doesn’t need to see you in person, as knowing your medical history is the most important part of many exams. He can talk to you about your symptoms through the program, and in addition to the video link, you can upload pictures for him to examine. Why would I use telemedicine? There are many reasons you might choose to use Dr. Toll’s telemedicine service. For example, if you’re traveling and come down with an illness, you can meet with Dr. Toll virtually to discuss your symptoms and get a prescription and recovery advice. Alternatively, you might also choose to use his telemedicine service if you can’t secure a babysitter or don’t want to bring your kids to the office with you. Or if you’re working on a weight loss program with Dr. Toll, telemedicine is a convenient way to check in and catch up on your progress. Whatever your reason for choosing telemedicine, you can benefit from the convenience this technology provides. What should I expect from telemedicine? Dr. Toll uses the EVisit telemedicine program to provide remote services. You can download the app to your phone, tablet, or computer and you create an account. You use your account to request remote appointments and connect with Dr. Toll. During your appointment, you video-chat and talk about your symptoms or conditions. You and Dr. Toll can see each other so he can assess your appearance for signs of illness. You can also upload pictures, for example, if you have a rash, for him to review. If you need a prescription or a referral, Dr. Toll can provide it virtually. Otherwise, he gives you advice on how to manage your symptoms and improve your health. Telemedicine is convenient. You can meet with Dr. Toll from the comfort of your own home and don’t need to spend time in the waiting room. The technology is easy to use and secure to ensure your privacy. If you want to know more about Dr. Toll’s telemedicine service, call or schedule a consultation online today.